When many think of college, especially paying for it, the first thing that comes to mind is a loan. While student loans (both federal student loans and private loans, either secured or unsecured personal loans) are a way to help pay for tuition, they’re not the only form of financing. In addition to grants and scholarships provided by the federal government and some institutions, there’s another way to help pay for college: tax credits. There are a number of tax credits available from the Internal Revenue Service (IRS) for use in furthering your education or helping your child to afford theirs. 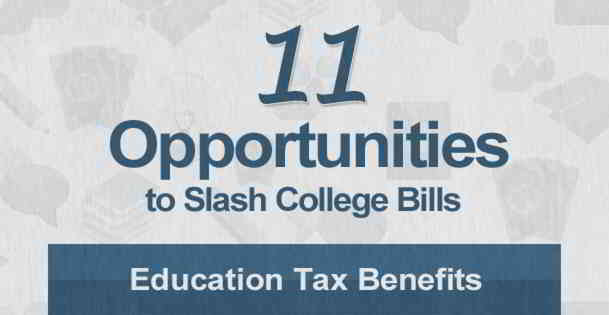 There’s the American Opportunity Tax Credit (AOTC), which is actually an extension of the Hope Scholarship Credit. There’s also the Lifetime Learning Credit. Both the American Opportunity Tax Credit and the Lifetime Learning Credit can be subtracted from your federal income tax in full. There are also savings plans that can help to reduce college expenses and the related tax burden. Many states offer Qualified Tuition Programs (QTPs, also referred to as 529 college savings plans) to help parents put money aside for when their children reach college age. The 529 plan offers a tax advantage for those who are investing for college — the advantage is that all withdrawals from a 529 savings plan are tax-free. In addition to 529 plans, there is the Coverdell Education Savings Account (ESA). While any contributions made to a Coverdell aren’t considered tax deductible, whatever is deposited into these accounts are considered tax-free until the money is distributed to the beneficiary. The following infographic explains more about each tax credit and savings account option. Next Next post: Get A Personal Loan Or Use A Credit Card?